Fran Keenan deftly blends eclectic pieces with tradition, adding in just enough of a modern touch for personal, inspiring, and current style. ART It is hard not to overthink a salon wall, but it never looks right jumbled together on the floor. The common backdrop of the wall color and texture validates each piece and enables them to work together. I also like to think that the client is the common denominator—all chosen by or for that person specifically. One of my favorite parts of working with a client is choosing the art and finding what works. HOW ABOUT THAT NEW STUDIO? At times, it can be a beautiful mess! But we are so grateful to have a space where we can be so productive. We love our studio days. We bring in coffee, turn up the music, light a great candle, and find our decorating mojo. I also think it has been fun for our clients to see how we work and how we pull things together. We do have things for sale, but we are moving targets during the day, so right now we do not have retail hours. I tell people that if you see something you like in the window, just email us. FAVORITE LINES? Oh wow! Where do I begin? We pull from everywhere. I am partial to antique chests, tables, and most other case goods. I am devoted to so many local antique dealers in the area. For upholstery, I love MCJ Interiors (205.458.2700), where I can customize the frames and use fabrics specific to each project. I adore all things from Quadrille (NYC, D&D showroom: quadrillefabrics.com), Jasper Collection by Michael Smith (michaelsmithinc.com), and Peter Dunham from Hollywood at Home (hollywoodathome.com). Of course I adore all of the the wonderful, established fabric houses—all found at Birmingham’s very own DSR showroom (to the trade). ACCESSORIES Simple and strong are my two favorite accessory adjectives. And every accessory needs to try out as if it is fighting for a part in a Broadway production. I love to teach clients how to be fierce editors in their own homes. Things can rotate, but everything doesn’t need to be out all of the time or it gets lost in the competition. FAVORITE COLOR COMBOS We are currently working on bedrooms for three sisters, and we are having a blast with their off-the-radar color palettes and how they relate to each girl’s personality. Olive green and fuschia is just one of the combos. I might want to live in that room when we are done. SPLURGE? SAVE? An antique chest is tough to beat. I believe you really do get what you pay for when it comes to upholstery. If your budget is tight, splurge on your sofa and choose a natural fiber rug. I also have a hard time with cheap lampshades. It doesn’t matter what you pay for a lamp—$5 at the thrift store or over $2, 000—a well-made lamp shade can elevate an entire room. UTILITARIAN LUXURIES Beautiful pantries, lavish laundry rooms housing kids’ craft corners, and moms’ command centers have become priorities. It makes sense because we spend so much time in these spaces. We need a place to hide all the gadgets and gizmos. Stylish, beautifully decorated storage for the aspiring cook, diligent laundress, or organized homemaker is a necessity. I ripped out the powder room in my own house for a walk-in pantry. Having a place for things is the ultimate luxury. THE CLASSICS Good bones are your friend. Decorating is too expensive to be trendy. I always enjoy working with antique rugs, especially in newer houses. They bring authenticity to any project. A simple drapery with tailored hardware and simple, small pleats is always timeless. EMERGING TRENDS? We are hearing that people want their homes to be more personal than ever. It’s not just what looks good; things need to have a story. The all-white, tonal house is lovely, but for those that love color, they will never feel finished until they add that colorful layer. Some people say wallpaper is out of style. Ha! I didn’t get that memo. And don’t be afraid of trying new things such as metallics. I’m all for using these in subtle ways. ARTIST TO WATCH? Birmingham has such a wonderful art culture. Catherine Jones is my newest art crush. We just commissioned her to do a seven-foot abstract piece that is absolutely exquisite. I also love her graphic silhouettes. PERSONAL FAVORITE? I have an oval Victorian table that my grandparents purchased. I have been told that it was one of the first pieces they purchased together. I get inspired by mixing curvy pieces such as this table with modern accessories and textiles. 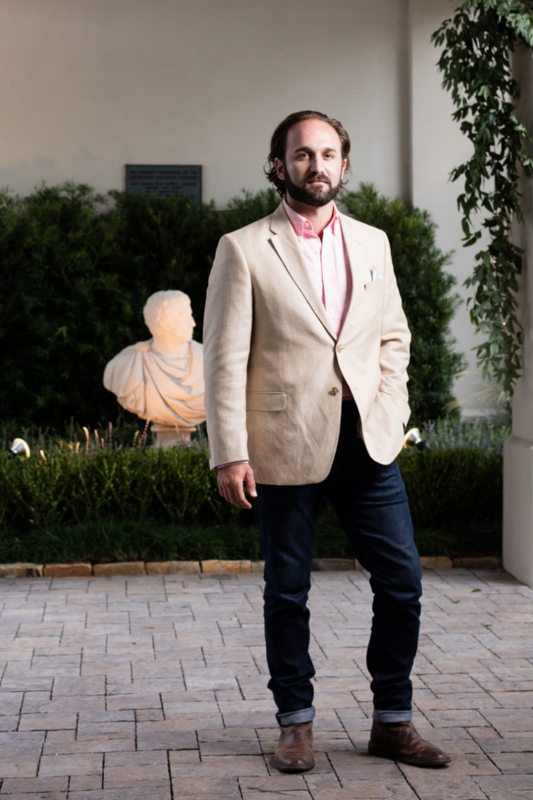 With offices in Birmingham and Chattanooga, Hannon Kirk Doody and Doug Davis, the talent behind Hannon Douglas, are making design waves nationally and across the Southeast. FAVORITE SOURCES We love upholstery from Lee Industries and Verellen (verellenhc.com), lighting from Barbara Cosgrove and Visual Comfort. For antiques, we shop Circa Antiques and Interiors and Henhouse Antiques. In Chattanooga, we like Revival. For antique rugs, we call on Paige Albright Orientals. GO-TO PAINT COLORS White Dove and Coastal Fog from Benjamin Moore and Pale Powder, Down Pipe, and Strong White from Farrow & Ball. SPLURGE? SAVE? We really love Cole & Son patterned wallpaper in small spaces like powder rooms. It’s relatively expensive but worth it! While we love fine oriental rugs, we often start with a simple grass or wool base when working with a tighter budget. It’s easy to come back and layer a smaller patterned rug later. TREND SPOTTING We try to look to classical principles more than trends, but luckily we’re seeing a lot of ‘old school’ elements like wallpaper, big traditional patterns in fabric, blue and white china, and brass and silver finishes. Using established styles make a space feel timeless. THE CLASSICS We select upholstery with classic arm and leg details like Chesterfield sofas or English arm club chairs. These pieces work well in almost any space. ARTIST TO WATCH Clara Blalock’s pieces are great. She shows at Beverly McNeil Gallery in Lakeview. ACCESSORY OF THE MOMENT We love footed cutglass hurricanes for fresh flowers or fruit or as candleholders. 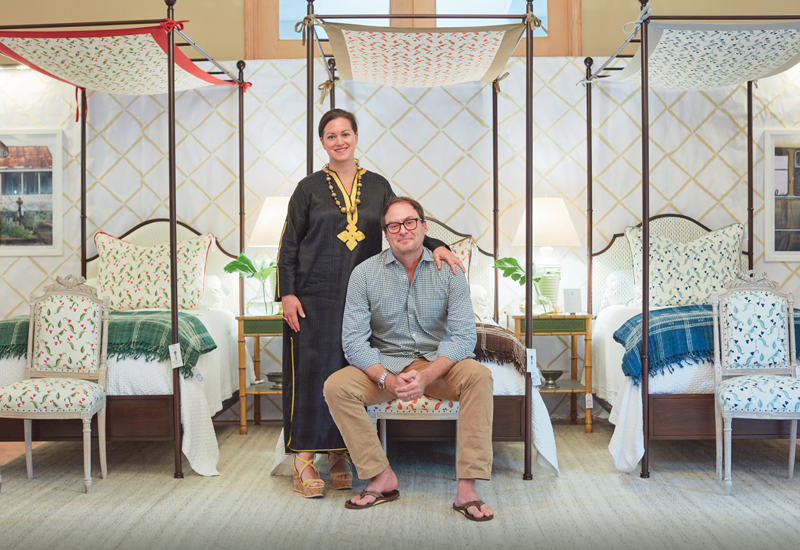 Covering both interiors and outdoor living, these Birmingham-born brands have grown to become one of the essential lines in home furnishings. ACCESSORIES Once large pieces are placed for functionality, appeal, and performance, then accessories can be brought in to complement the pieces that surround them. They add texture, color, and ambiance. Right now, we are using garden pieces such as urns and statuary inside. GO-TO COLORS Black and cranberry; navy and gray; and Benjamin Moore’s Ballet White. SPLURGE? SAVE? Invest in antiques, lighting, and rugs. You can save by selecting and placing existing pieces that are transitional or have sentimental value. Personal pieces help make a space uniquely your own. TREND SPOTTING The great thing about today’s design is the eclectic mix of pieces. It’s easy to create a signature look. Mix new pieces with antiques, add hot pops of color, and use wallpaper to define your space and make it yours. 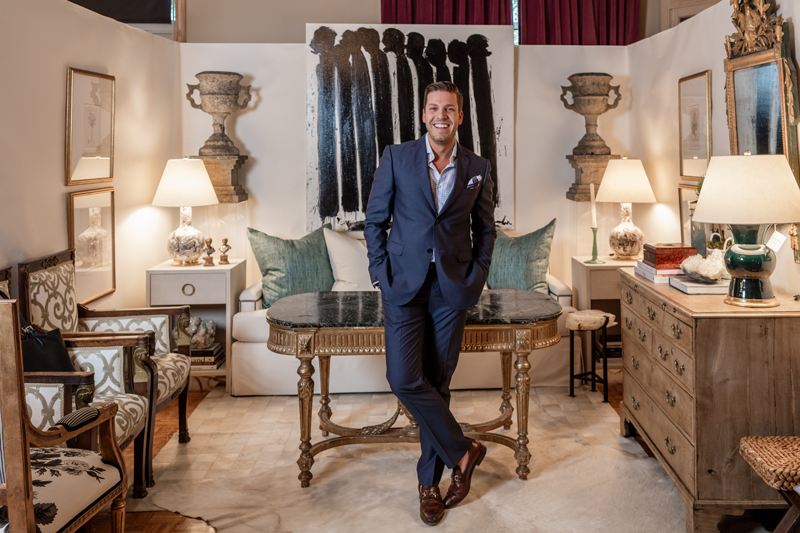 THE CLASSICS Twice a year, Gabby designers shop European markets to seek unique finds and antiques to give patina and extra character to their showroom vignettes. Summer Classics and Gabby • 3140 Pelham Parkway, Pelham. 205-358-9400. 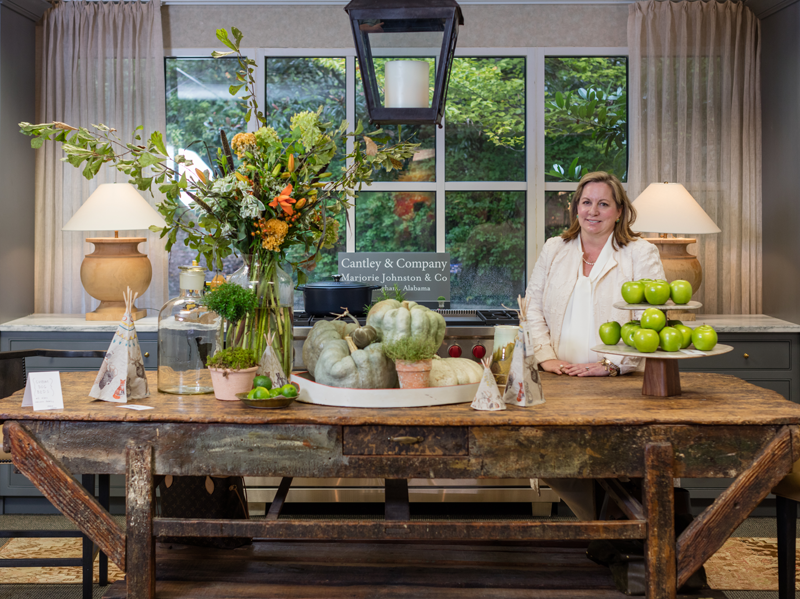 Cyndy Cantley partnered with Marjorie Johnston Interiors to layer on the patina in their at the Tastemaker’s Event last fall. Designer Cyndy Craig Cantley knows what makes the kitchen the heart of the home. Mixing bespoke English cabinet designs with antiques and fine finishes, the designer creates spaces that are at once purposeful, beautiful, and lived in. THE WHITE KITCHEN We have done varying shades of white kitchens for 20 years. I do not believe in kitchen trends. I think you should do what you love. Kitchens are expensive, so have fun with the accents. If you love gray, paint your walls gray. Slip-cover your chairs in a fun color, or do a crazy wallpaper. These are all easy projects that are relatively inexpensive to change in a few years. Cabinets, countertops, and backsplashes are not. DESIGN INSPIRATION My inspiration comes from my clients. I have to find out what they are expecting. Maybe their kitchen is rarely used but they still want it to be beautiful. Or perhaps the kitchen is the main gathering space where everything happens. I also get a tremendous amount of inspiration from traveling. I go to New York and New Orleans several times a year and visit as many museums, restaurants, and old hotels as possible. DESIGN APPROACH Some kitchens are easy to design while others take time. Until I can see it in my mind, it does not get put on paper. I had a boss years ago that taught me to design a kitchen on a calculator. It doesn’t sound very romantic, but it works. A kitchen has many rules and must fit into the space. I still hand-draw everything to help develop the details. FOCAL POINT Hoods can be an incredible focal point. A wall of cabinets with glass doors helps you see the personality of the china, crystal, and silver. Always leave a space for art. Nothing is worse than just lining the walls with a bunch of cabinets. SPLURGE? SAVE? Splurge on your cabinets, countertops, and appliances. These things are all rather permanent, and you should get the very best you can afford. Save money on things that are easier to replace over the years. THE CLASSICS I love leaded glass, marble countertops and backsplashes, mullion doors, unlacquered brass, and European pewter hardware. Wainscot panels and clean, simple English door designs are things I like to incorporate. She’s the designer, he’s the photographer. Together this husband and wife design duo combs the globe seeking inspiration for inspired photography and relaxed interiors. ON COLLABORATING David’s work is a collection of our travels together and it was amazing to see his work in large format. My fabric line has been in the works for a few years, and the timing was right to see it carefully sewn in to decorative furnishings for the home. HOW MANY LINES/ COLORWAYS DO YOU HAVE? There are two designs, each in five colorways, all hand-printed on 100% linen in the USA. I decided to take an authentic and domestic approach to ensure that quality would be the priority. INSPIRATION I’ve been drawing botanical images for years. I studied screen printing in art school and fine art at the Sorbonne in Paris with emphasis on painting. HOW ABOUT THOSE GREAT BEDS? I ordered these custom twin beds as a way to display the fabrics. Everyone seemed to love them! I have sold 10 of them since the show. ARTIST TO WATCH William McLure is a creative genius. He hand painted the walls in our space. 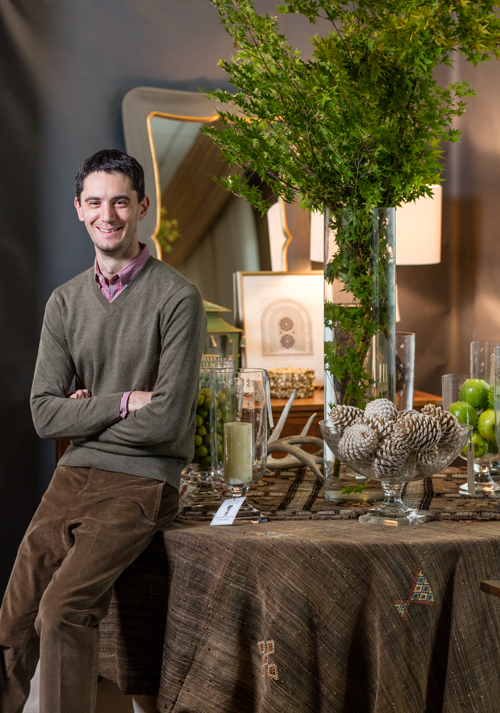 William works as an interior designer for architect Bill Ingram in Birmingham, Alabama. GO-TO SOURCES For fabrics and wallpapers, I love Quadrille. It’s timeless and cheerful. I never tire of it. I love anything grasscloth, woven, or natural. For bedding, I prefer Matteo and Peacock Alley. For rugs, I opt for Starck carpets. For paint, I choose Farrow & Ball paints. ACCESSORIES As a photo stylist for Southern Living, I love to finish out a project with accessories. I think that the last 10% percent of layering a room is the most important piece of design. Collections are an authentic way to accessorize. PERSONAL FAVORITE Our dining room table! My father bought it for us at an auction in Virginia. He completely restored it himself, with layers and layers of varnish, loaded it up and drove it here from Virginia in a Uhaul. It was a perfect wedding gift and a total labor of love. THE CLASSICS I like to think of my projects as timeless. Great art and photography are the next wave of finishing touches. Antiques and color are making a comeback. Classic English sofas and chairs, vintage rattan, and sisal rugs are here to stay. ARTIST YOU HAVE YOUR EYE ON My husband! David Hillegas. 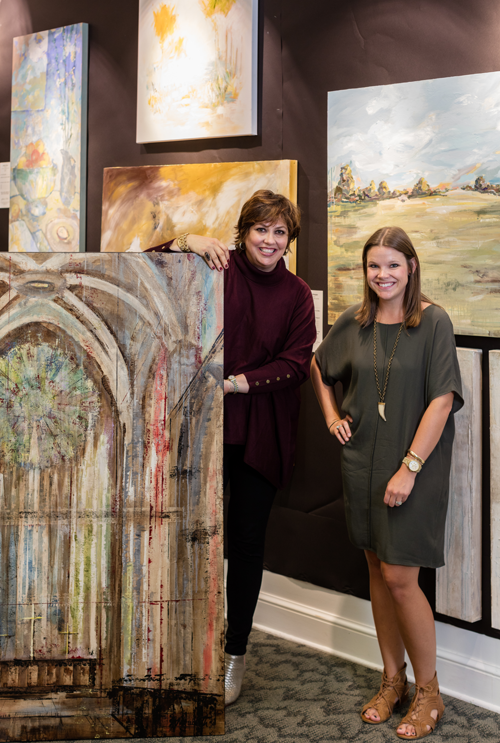 He shows at Ware & Co. in Mountain Brook Village and Shaun Smith Home in New Orleans. Anna Wunderlich represents David in Memphis, Tennessee. Believing that great landscapes begin with a great design, Daniel McCurry seeks to enhance the environment through respect of architecture, native plants, and the organic flow from home to garden. GARDEN STYLE Most of our clients fall more on the traditional side of design. At the same time, no one really wants a classically-designed formal landscape. They want to be taken to a different place that makes them feel a certain way—like the French countryside. I select native plants to add a more organic feel. These things, in combination with a little bit of my own flair, seem to equal a fresher, modern look. TOP CONSIDERATIONS 1. Architecture. The outdoor space should be an extension of the house, like another room, so that the flow from inside to outside is natural and smooth. 2. Existing features. Whether dealing with natural topography, beautiful existing plants, drainage patterns, structures, etc., it is crucial to know about all of these things before you begin a design. 3. Orientation and exposure. This pretty much boils down to the direction the house faces, which affects any features we design, such as fireplaces. Knowing this will help us figure out the sunny spots and shady spots so that we can make better plant selections. GARDEN ACCESSORIES Sometimes garden accessories can be the very thing that pulls it all together. They can also be strategic in terms of transition from space to space or creating a sense of invitation or mystery. FAVORITE COLOR/PLANT COMBOS? The combination of boxwoods and white hydrangeas is pretty classic, but I love adding ornamental grasses to the mix for intense contrast. I also love mixing different shades of greens such as Autumn Fern, Hellebore, and Hosta or Mondo. SPLURGE? SAVE? If you fall in love with something, splurge on it, especially, if it is an accessory or feature. You will love it so much that in time you probably won’t care about the cost. An easy way to save is on plant size and quantity. Lots of folks initially want a garden to look full grown when installed—and then they get the project estimate. We take care to pick healthy plants and keep them healthy. All you need to do is be patient. After a couple of growing seasons, you won’t even remember what they looked like! Never cut corners on hardscapes, drainage, irrigation or soil preparation; you will forever regret it. HOW WOULD YOU DESCRIBE YOUR OWN HOME? Comfortable, low key, beach dwelling-ish. It’s a place to lay our heads. My wife and I travel a good bit. ARTIST YOU HAVE YOUR EYE ON? Marguerite Andrews used to work for Father Nature years ago. Her garden illustrations were impeccable and from time to time I try to convince her to do a design or two for us. Now, she is transitioning into an artist, and I cannot wait to see what she comes up with. 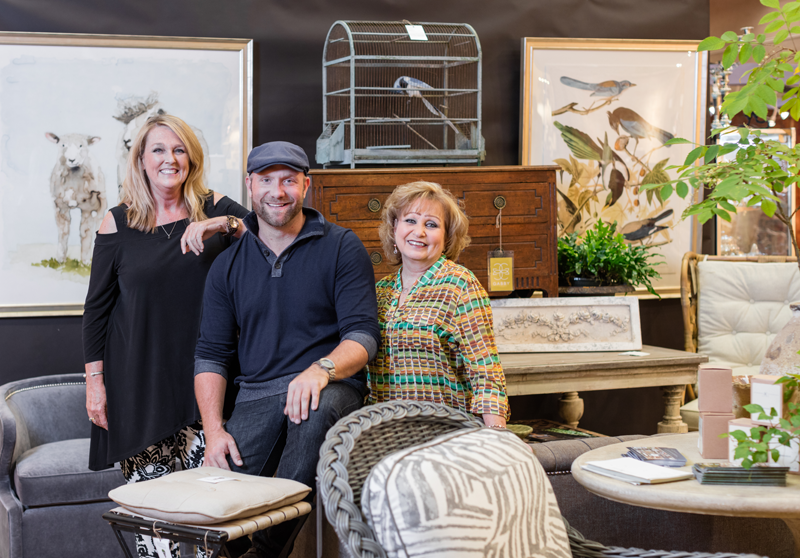 New Orleans shopowner and interior designer Shaun Smith joined Birmingham tastemakers to display his talent for mixing vintage, modern, and antique pieces paired with clean upholstered furnishings. LOVES Fabric: My all-time favorite drapery fabric is Lily Pulitzer’s Rip Roaring White (leejofa.com). It’s a silk linen blend that’s elegant yet effortless. Seating: I really love the Lee Industries Moyen Lounger (leeindustries.com). It’s the perfect combination of feminine and masculine lines wrapped up in a comfy chair. Lamps: Christopher Spitzmiller lighting. Once you see it in person, nothing else will ever compare. PAINT TIPS I am a big fan of the Fine Paints of Europe lacquer paint (finepaintsofeurope.com). I just painted a client’s sitting room in Benjamin Moore’s Dove White in this laquer paint. It is stunning. Benjamin Moore’s Blue Note is the perfect blue for an office or boy’s room. Go bold when it comes to a powder room. SPLURGE I tell all of my younger clients to splurge on one good antique every year. Look for classic pieces such as a Louis-style chest or a beautiful Trumeau mirror. In a few years, your house will be filled with timeless pieces that tell a story. TRENDS A trend that has become less trendy and is here to stay is wallpaper. The wallpaper industry has changed so much because of the technology available now. I always suggest starting small with a bathroom or hallway if you are iffy about it. However, once you do it you will get the bug and want to put it everywhere! I am wallpapering two guest bedrooms in my own home with classic twigs patterns. ARTIST TO WATCH Mallory Page in New Orleans. The colors and movement in her pieces are breathtaking. COLLECTIONS I really enjoy collecting unique antique boxes. I also think they make the perfect gift. I love that people have been tucking away personal letters, collections, etc., in these boxes throughout time and now they are living in my home. Curating a collection of contemporary and traditional art by established and emerging artists, Gallery 1930 in English Village and its sister gallery, SCENE, in Pepper Place, is a place for first-time buyers and collectors alike. SELECTING ARTISTS We always have an eye out for artists whose works feel fresh and current yet timeless. Whether figurative or abstract, the work needs to express the individuality of the artist. WHAT BUYERS WANT Art buyers in Birmingham seem to want a blend of classic and modern styles. YOUR SERVICES We love helping our buyers select art. There is never a charge for a consultation, and we encourage customers to take pieces home on approval. Everyone needs to see how the art works in their own space before purchasing it. ON MATCHING ART You should never try to match art to other pieces or to your furniture. Your art should simply reflect your personal style. If you’re eclectic, then let your space reflect that. If you are strictly traditional or modern, then the same thing goes. Art gives your home or business life and personality. APPROACH TO FRAMING Framing depends on the piece of art and the space. At the same time, changing a frame on a painting that feels dated or tired can totally transform the work. A frame can make you love a painting, but it can also have the opposite effect. UPCOMING SHOWS Gallery 1930 is currently featuring the dramatic photography of Arden Ward Upton. SCENE has a beautiful installation right now with a number of new pieces by an assortment of artists. We also have monthly group shows that are held at both galleries. Our shows always feature amazing art that draws a fabulous crowd. You can sign up for our gallery emails to receive updates. Upcoming shows include Maralyn Wilson, Meredith Keith, Arthur Price, visiting local artist Thomas Andrew, and acclaimed Cuban artist Harold López Muñoz.